Sammath Naur Pt. 4: ‘The Ring is mine’, plus jan-u-wine’s “That Which is My Own”. 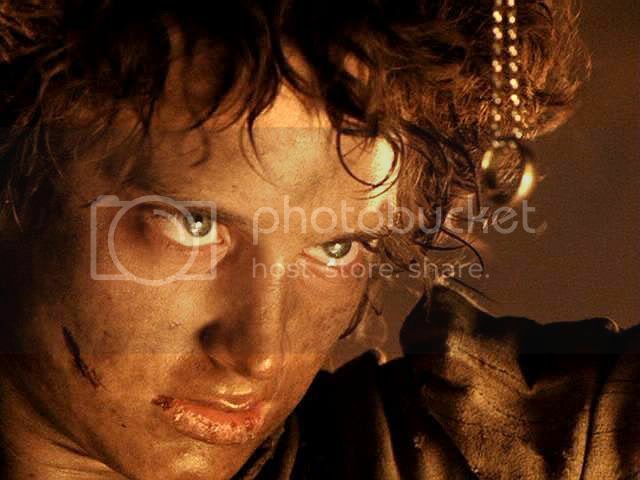 The book text continues here until Frodo, or Sauron’s Ring working through Frodo, reaches his terrible decision. 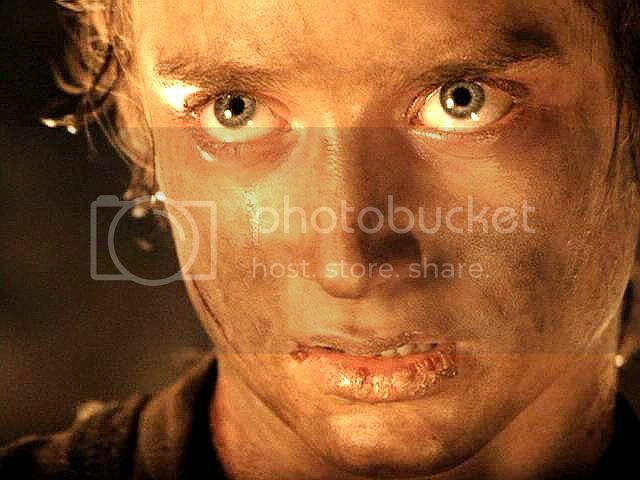 How much, if anything, of Frodo remained at this moment? I believe some corner of his consciousness remained, some pocket of last defiance that could not be extinguished. 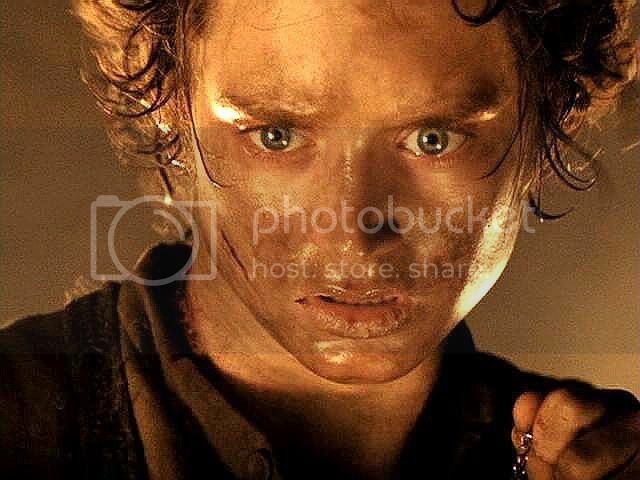 I just finished rereading Tolkien’s The Children of Húrin, and this sounds like something Morgoth, and Sauron after him, would relish: rendering his adversary helpless to resist, but letting him live, only to make him the witness of his own ruin and debauch. 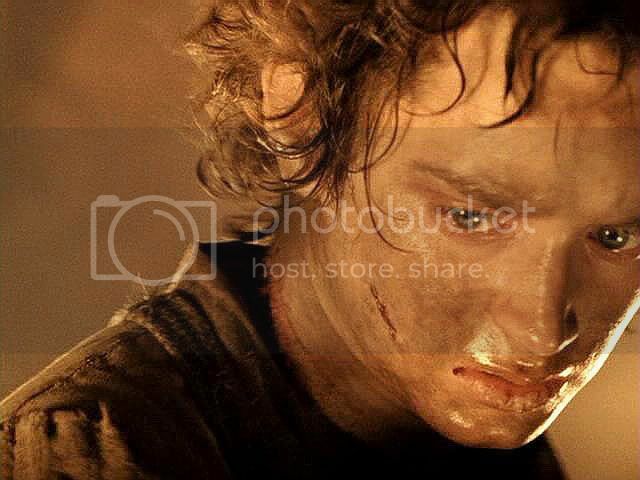 That there was some part of Frodo left, some corner of his mind still aware of what was happening to him while it happened, overpowered as he was, is borne out by his subsequent feelings. 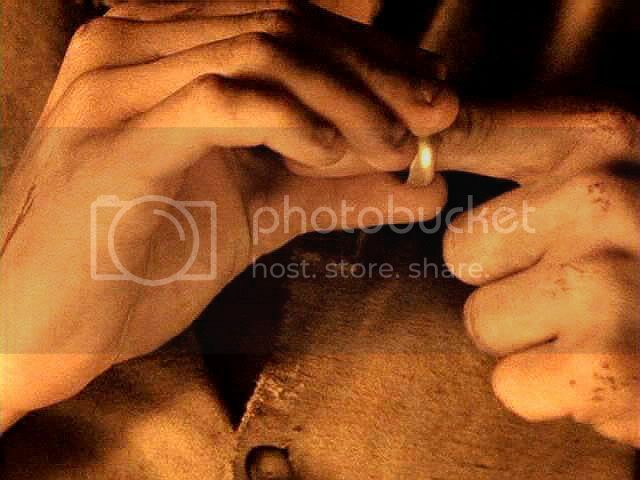 If he hadn’t been somehow “present” as the Ring and its Maker pinned his will to the mat, he would not have remembered what had happened enough to feel the sense of guilt and failure Tolkien said he did, once he was back in the Shire. 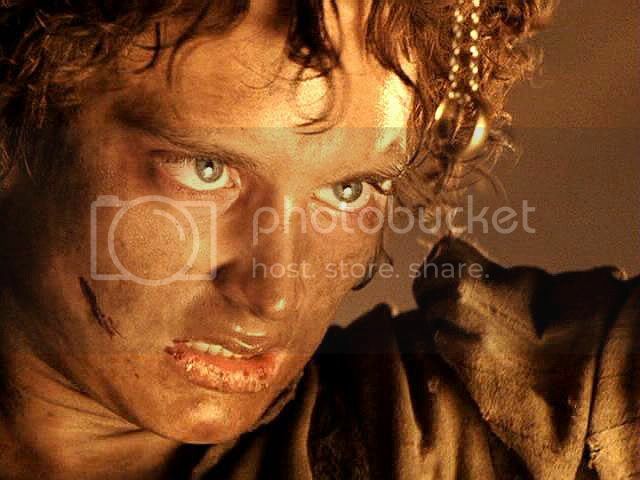 [N]ot only is it Sauron's pleasure to squash Frodo til he can’t resist, then torture him by letting him live to witness his own degradation, he also must witness Sam's heartbreak: leer at it with Frodo's own face: Frodo taking that in, and Sam's reaction. Whatever the filmmakers intended to do, they evoked this dynamic very, very well. 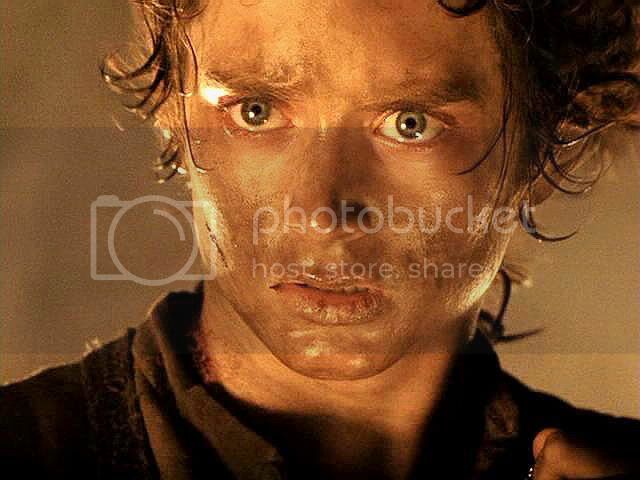 The light sprang up again, and there on the bring of the chasm, the very Crack of Doom, stood Frodo, black against the glare, tense, erect, but still as if he had been turned to stone. "Just let it go!" 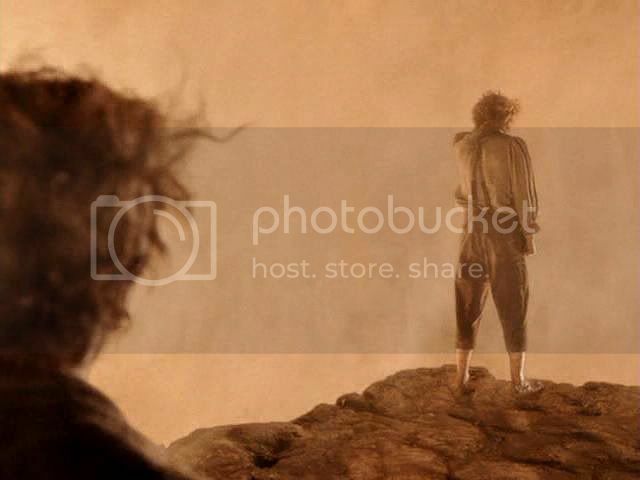 waits in suspense, Frodo still turned away from him. 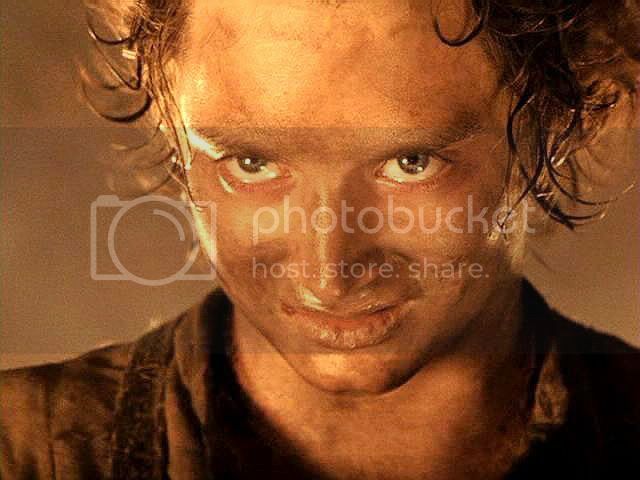 Frodo: The Ring is mine. 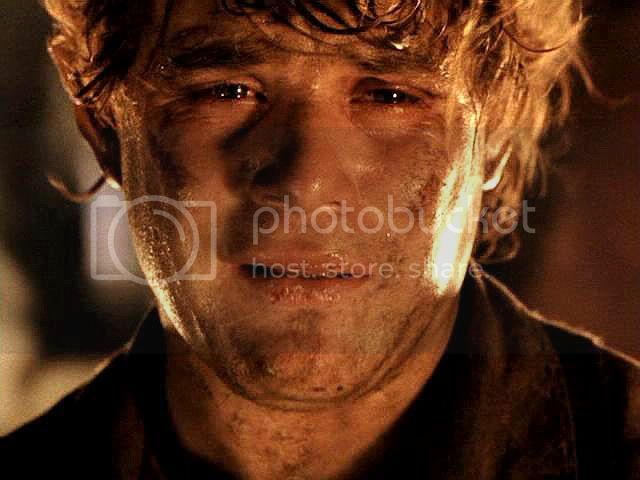 That there was some part of Frodo left, some corner of his mind still aware of what was happening to him while it happened, overpowered as he was, is borne out by his subsequent feelings. 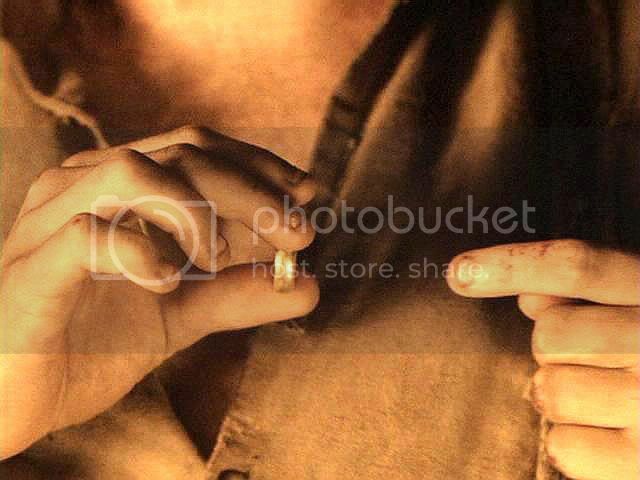 If he hadn’t been somehow “present” as the Ring and its Maker pinned his will to the mat, he would not have remembered what had happened enough to feel the sense of guilt and failure Tolkien said he did, once he was back in the Shire. That's a great insight. 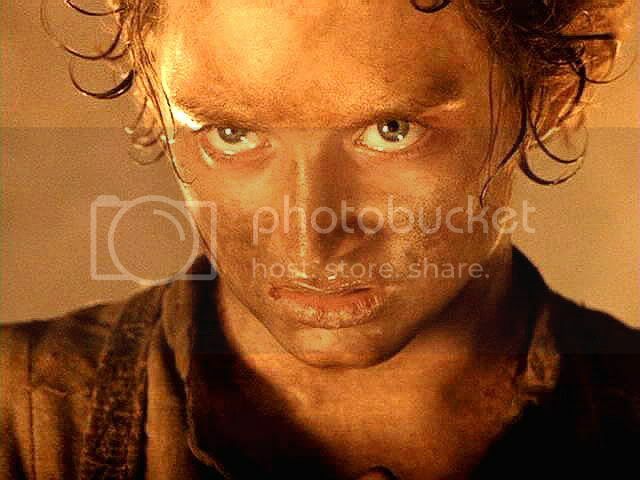 What a powerfully lit, filmed, and acted scene! It is a FANTASTIC scene. Everytime I watch it, over and over in the film-fan part of my mind, I can only say, "GUH!" and "WOW!" "Swallowed up". That's a vivid way to put it, Mews. Thanks for the image. I'll remember it. 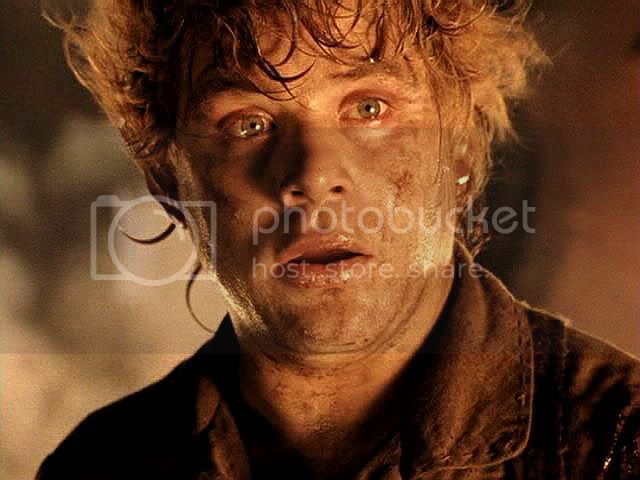 I think that what amazes me the most in this scene is Elijah's (or Frodo's) physical transformation. 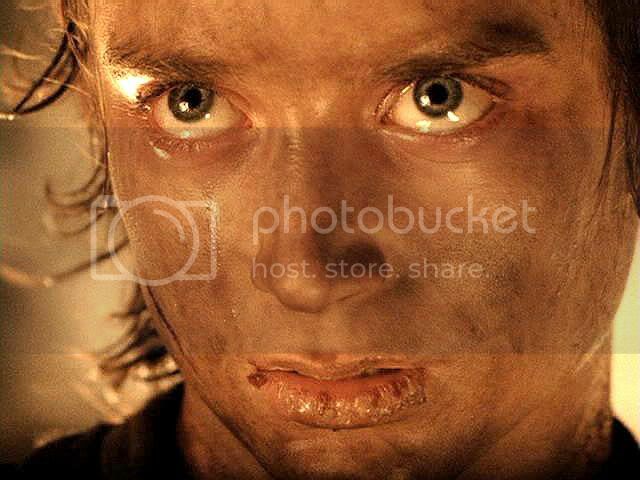 When I saw RotK for the first time I had my son with me (he was 11) and I remember he was sure Elijah had not acted in that scene. 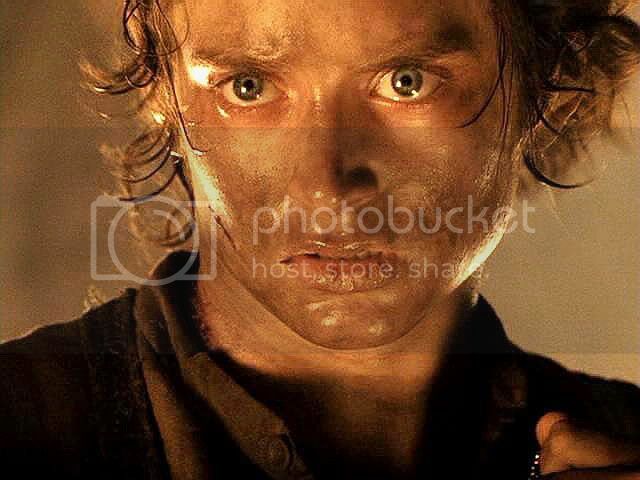 I had difficulty in convincing him Frodo was not played by a stand-by! 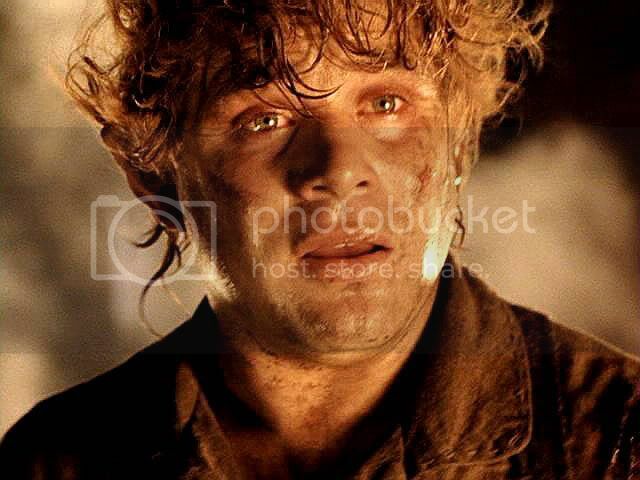 :) But I can understand his hesitation: Frodo truly is not himself in that scene, and Elijah conveyed this feeling perfectly. It's just an astonishing scene, Bagma. A tour de force by everyone involved, cast, crew, everyone. But to think EW was SO young! That's some poem, I know. It gives me a blow to the gut, but I love it. Oh, man. It gets me every time. Anyone who watches this and thinks Elijah's acting is only so-so simply isn't looking. I agree, Bunny. He's awe-inspiring in this scene. Sam is flat-out marvelous, too. Oh...I have stinging tears in my eyes looking at that face...the inevitability...the futility. I wanted to scream when I saw him and knew what was coming. 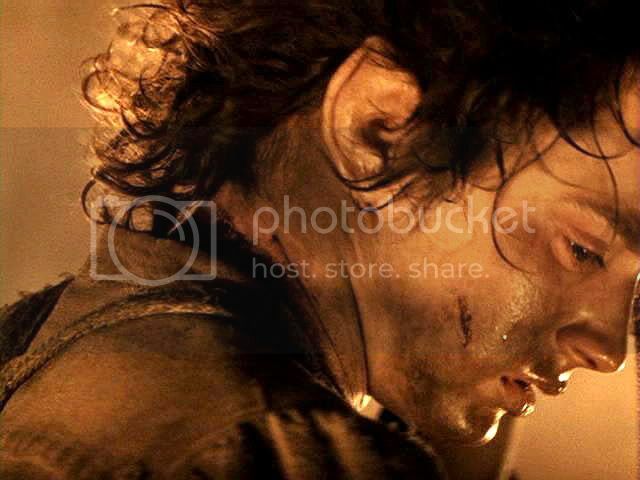 Resolve and he's gone...Frodo was leaving..he looked so vulnerable and confused for one striking moment..then he let go and his face changed and he sneared with that beautiful face. and we felt so lost. 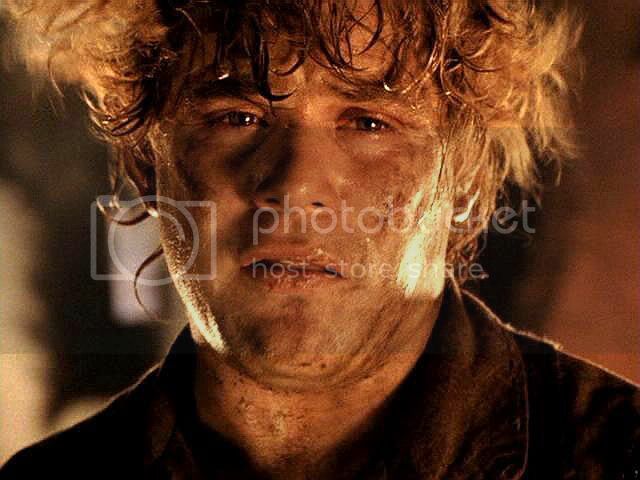 "Not only is it Sauron's pleasure to squash Frodo til he can’t resist, then torture him by letting him live to witness his own degradation, he also must witness Sam's heartbreak: leer at it with Frodo's own face: Frodo taking that in, and Sam's reaction." is heartbreaking and true. 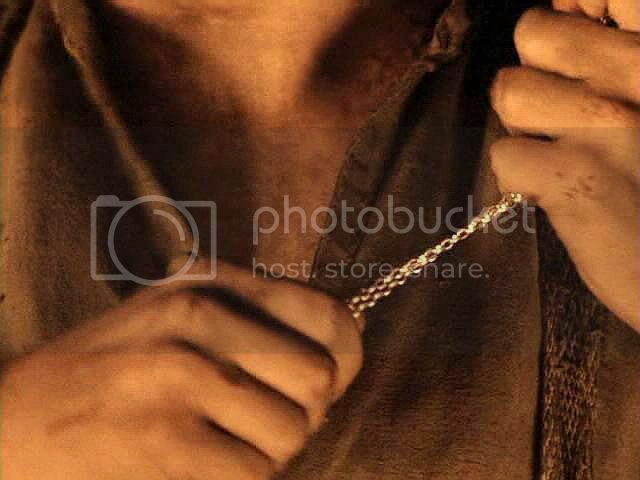 It is what shows the shame Frodo could never relinquish and carried with him to Grey Havens...the boat...looking for release. 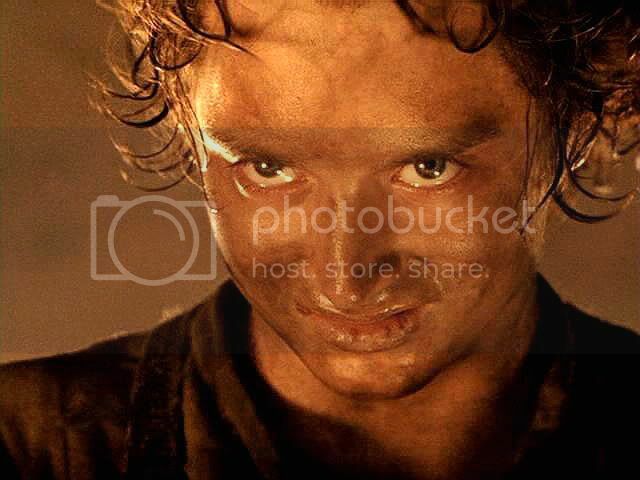 You can even see this in Frodo when everyone is bowing to the hobbits..and his look of pale confusion. Not realizing that even in his failure, but not..there was greatness. He was so mighty and so small, so true. No one could have carried this burden but him. Makes me sigh with a heavy heart. thank you...and I have the book "Children of Hurin". Just got it but haven't read it yet. 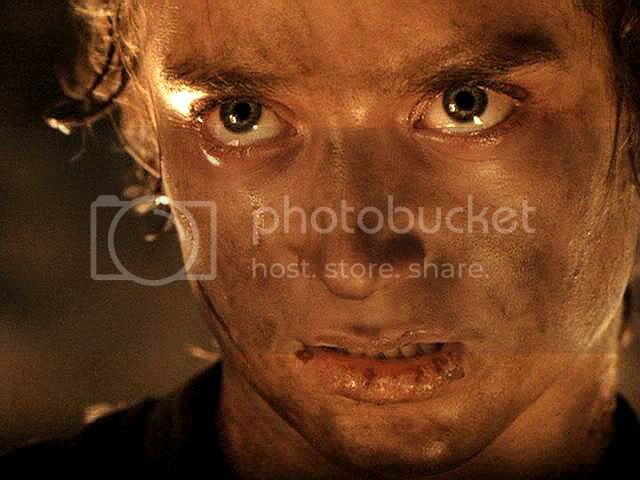 You can even see this in Frodo when everyone is bowing to the hobbits...and his look of pale confusion. Not realizing that even in his failure, but not..there was greatness. He was so mighty and so small, so true. No one could have carried this burden but him. Now you have *me* crying, Verangel. He was so beloved, and so unwilling to believe it, still haunted by that sense of shame. This post was so moving and terrible and wonderful all at the same time. Thank you for the pictures and thanks to Jan-u-wine for once again bringing me the most intimate and heartwrencing interpretation of these moments. I want to read all the screencap posts, but it makes me cry so much and I have to take it little by little. I wish there was some way to publish these "meditations" or what you would call them in a compilation form of some sort. Thank you so much for your comment, Eandme, on mine *and* jan-u-wine's behalf. I'll send her a note. I wish I could print them out, too. But there's no way I could afford it and get the same look the posts have on a computer monitor. To be effective the images would have to be really big, as big as on the computer. The series would fill volumes of big, "coffee table" size books. One still wouldn't be able to "scroll" through a series to see the way his face changes in the same way, either. A hard copy version would be neat, though, just to have in a solid, holdable form. I'd say this is simply one of the most powerful and haunting scenes that have ever been captured on celluloid in the history of cinema. Period. Just exquisite. I have friended you. I hope you don't mind. Finding your LJ was like discovering a treasure. Thank you for your amazing posts. Rakshi, thanks for commenting. I am always pleased to hear that someone finds things here that help their appreciation and understanding of Frodo, LotR, and Tolkien. Of course I don't mind if you friend the journal. It was created not just as a forum for me to express myself, but as a resource where fans could browse and recharge, find images, etc. "I believe some corner of his consciousness remained, some pocket of last defiance that could not be extinguished." This scene always gets me when I'm watching it. When I was watching the movie in the cinema, a friend of mine asked me - seriously - is this still the same actor? This can't be. Thanks for your comment, Julchen. You always like to mull things over, which is why I think you enjoy them the way you do. Me, too (like to mull things over). I thought so, too. All the more when I did the post pairing images from the first and last parts of the trilogy. What a 'character arc'! I will be so sorry if he never gets a really good role again.